My favorite part of the Cold Lake Trip was probably being able to see the CF-18, so close to stair down the barrel of its main weapon, sitting in the cockpit and learning about its top speed of MACH 1.8. My most favorite part of the Cold Lake trip was going into the Restricted areas and seeing the CF-18's. Being able to go in the Control Tower and touring the Base Fire Station was also exciting. Seeing the Search and Rescue Team and equipment, including the Griffin Helicopter was also exciting. The best part about the Cold Lake trip was sitting in the CF-18 (Hornet) jet. There are so many buttons inside the jet that each play an important role. I was very surprised by the size of the jet, i thought it would be much smaller than it was and I honestly never thought I could say that sat in one. I am very lucky to have the opportunity to do these activities with cadets. Without the slightest doubt, I have decided that when I grow up, I will be a SAR Tech! It must easily be the most exciting life possible. After a few years in basic military training, SAR technicians are selected for more extensive training in advanced trauma life-support, land and sea survival, rescue techniques from helicopters, (which includes being able to fly the helicopter home), parachuting, scuba diving, mountain climbing and rappelling. The men we spoke to simply loved their jobs. There was never a dull moment and they were confident that they could rescue people from very difficult situations and, if need be, send off their patient in the helicopter and survive by themselves until the unit returned for them. All day, every day, they do what they like most, knowing that behind them is a team trained to the utmost. Not only were we sad that time with them was limited, but they were disappointed not to be able to let us experience some of the techniques with them. We HAVE to go back! The Cold Lake trip was a learning experience. The best part of the trip in my option was when we were able to look at and hold the guns used by the Canadian Forces. The C-7, C-9 and numerous types of small arm weapons. The trip was worth if even if it means losing a few days of school. It was a fun trip. I really enjoyed the whole trip to Cold Lake. I have to say my favorite part was getting the chance to sit in the CF-18. It was a once in a life time experience. There were many cool and interesting facts to learn from the trip. The trip made some great memories for me. Thank you to the Parent Committee! All the things I got to see on the base were neat and exciting. I learned hoe to survive in an accident, how to fly a jet, and what my Papa did when he was on the base. We also got a picture in front of the plane my Mom was almost born on. My favorite part about the trip was when I got to go to my first ever museum, and having a camp out on the floor in the barracks with Cadet Evans. We also got to go in a fire truck and I almost went flying with a fire hose. 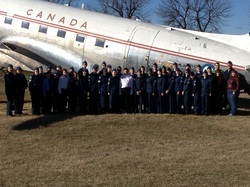 During our trip to 4 Wing Cold Lake we learned, experienced and saw many amazing things. Such as how to do first aid and we got to watch jets land and take off from the Control Tower. My favorite part of the trip was when I got to experience sitting in a CF-18 Hornet. I asked the pilot many questions about the plane such as its history and specifications. Sitting in a forty million dollar military aircraft was a once in a life time experience and I personally loved it! I had lots of fun during the Cold Lake trip. My time there was unforgettable. I wish I could do it thousand times over. I think we all here at 24 Squadron had a great time and those who did not attend missed out big time. We saw real military guns like the C7 and C9 along with a 50 caliber machine gun. Saw numerous CF-18's and also a Search and Rescue helicopter. We had the best time of our lives and I hope to go back next year! In my option the Cold Lake Trip itself was amazing and probably the most fun I've had in a while. I would have to say my favorite part was when we went and checked out the CF-18 Hornets. The CF-18 Hornet has always and probably forever will be my favorite aircraft ever. being able to sit in one was a mind-blowing experience that not many people can do. It was awesome. Overall, I think the whole trip was amazing and I would do it again in a heartbeat! The Cold Lake trip was one of the best experiences of my life. The first thing that occurred was when we stopped in St. Paul for lunch and discovered the worlds only UFO landing pad. After a good night sleep on the Base, we visited 410 Squadron and got to sit in a CF-18 Hornet. While sitting in the cockpit I had so many questions but I was so excited I couldn't remember them! We toured the Base Fire Hall, and then visited the Base Engineers where they were creating literally a tent city. We saw weapons used by the Canadian Forces, and visited the Cold Lake Museum as well. As we were cleaning up before boarding the bus back home it hit me that I just had one of my life's best experiences and hope that everyone had as much fun on this trip as I did.